” Guaras En Libertad La Belleza Regresa” (Parrots in Freedom Beauty Returns) is a conservation project begun in 2011. The Copan Maya Foundation has funded the educational component of this project in its entirety benefiting over 6000 school children throughout the Copan Valley. 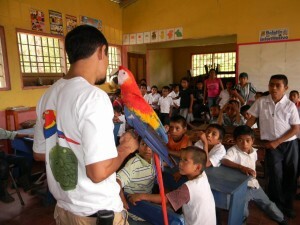 Fifty six schools received the conservation education about the importance of protecting the Scarlet Macaw which is also the national bird of Honduras. The nine educational modules (Spanish) are available in PDF form through this website and are free. This project has attracted worldwide attention. Proyecto Maya is a cultural education program existing in the Copan Valley for over ten years, The program was partially funded by the Copan Maya Foundation in 2013. In 2014 Copan Maya Foundation fully funded the program which included the distribution of individual workbooks to over 500 students. The Copan Maya Foundation provided funding for editing and printing of these workbooks as well as the funding for an educational steward and teacher’s aide to facilitate the teaching in the schools and ensure information was being disseminated properly. For schools unable to participate the Copan Maya Foundation donated copies of the workbooks to each school library. Renovation and addition of eleven new exhibits at the Casa K’inich Children’s Museum was finished in 2012. Casa K’inich is celebrating it’s sixteenth anniversary in February, 2018. Scanning of Eccentric Flints which were originally discovered in the Rosalila Temple over 20 years ago. New technology has peaked new interest in past projects and the Copan Maya Foundation funded this important project. Project Oropendola: The Copan Maya Foundation provided emergency funding to the Oropendola Project which had come to a standstill after years of work due to major political unrest in the central government. A large amount of tunnel consolidation work had been finished and a small section remained. The project could not continue because the new government was left with a major fiscal disaster. International aid had been frozen and time was running out because the project was due to shut down in less than six months. Copan Maya Foundation provided the necessary funds to complete consolidating the tunnels and also many delicate conservation tasks. A conservator was obtained for two months to finish much of the restoration of ceramic vessels removed from Tomb 08.01 in Oropendola Temple. During this time a journalist from Archaeology Magazine arrived to do research for an article. The exclusive article became the cover story of its September/October 2009 edition. Because of funds provided by Copan Maya Foundation years of work that would have been lost were rescued and the fifth-century tomb was presented to the world through this article. Expansion of Casa K’inich: Unique in the Maya world, the Casa K’inich has been lauded by articles in many international magazines and newspapers and has garnered attention from the directors of the World Bank. Casa K’inich was expanded to three times its original size and re-inaugurated on March 25, 2008 in Fuerte Cabanas, a rescued refurbished building overlooking the Village of Copan. It is open six days a week Tuesday through Sunday from 8 a.m. until noon and 1 p.m. until 5 p.m.. Special tours can be arranged by calling 504.2651.4105 or 504.2651.4103 in Copan Ruinas or emailing info@asociacioncopan.org. Entrance is free to all children under the age of 18 and adults pay L20 ($1.25). Ancient Maya Demonstration Garden: Offering an additional, intriguing, Maya-related experience for Copan’s 160,000 annual visitors, a demonstration garden provides tourists with the opportunity to see what the ancient Maya grew, and learn about ancient American cuisine, foods and plants. Additionally, the innovative garden serves regional subsistence farmers, by offering experiential classes in seed diversity, nutrition, and ancient and modern organic agricultural techniques. Copan Nature Trails: Winding through the Copan Valley, nature trails include outlying, rarely-visited Maya stelae, (carved stone monuments) as well as commentaries from leading biologists about unique regional plants, mammals, butterflies and birds. We have funded initial plans for the maps, signs, and guidebooks. Casa K’inich Childrens Learning Center is housed in Fuerte Cabañas overlooking Copan.